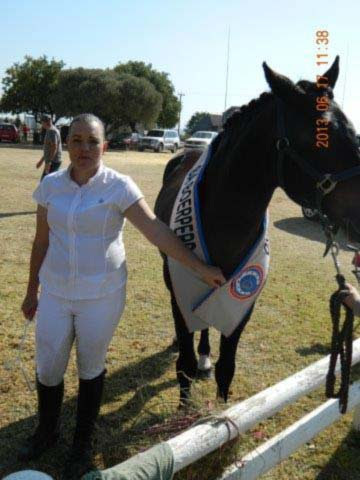 In June 2013, Lang Carel Tiptol and I had the opportunity of representing our Breed at the Neigh-bours Equestrian Event as part of the day’s displays. We had a wonderful time and after showing off for a while, we were able to interact with the members of the public. He was perfectly behaved, loved the attention and put in quite a sulk when we left the arena afterwards! What a star. 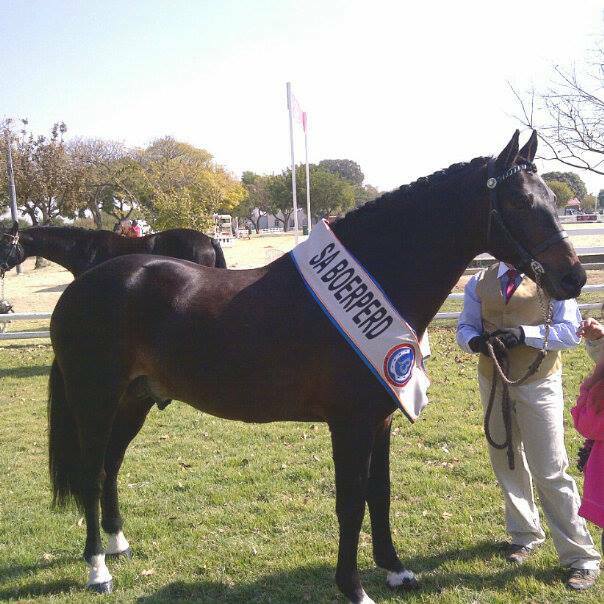 The SA Boerperd is South Africa’s only registered indigenous equine breed, and it has a long and distinguished origin. 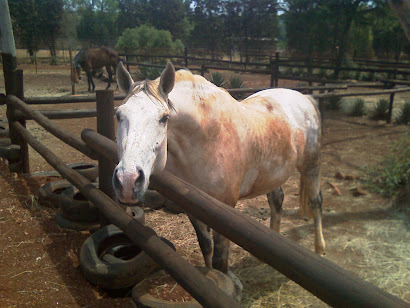 The Breed really came into its own during the Anglo Boer War and in 1905, shortly after the war, it was decided that the remaining horses should be preserved and recognised as a Breed in its own right. These horses are hardy, have strong hooves that often don’t need shoeing, they are good doers and are extremely human friendly. They are fantastic sport horses and excel at almost every discipline. 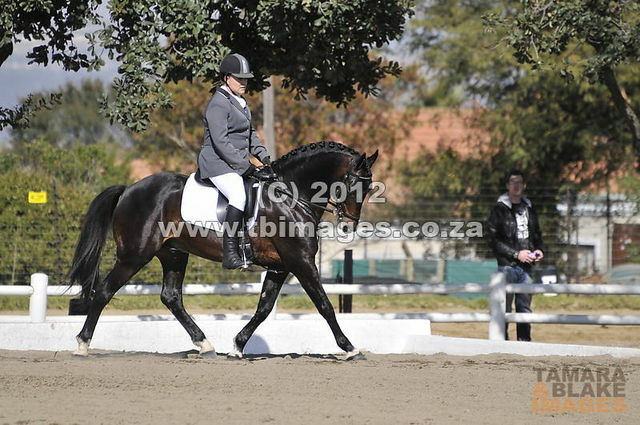 I am honoured to work with one of the top SA Boerperd breeding stallions in the country. On Our Way - All Excited! Just before the parade, we had time to work in a little bit of Dressage too! Not his best tests ever but I really enjoyed it! 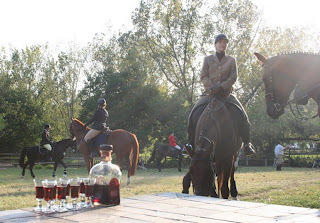 Countryside, Sherry and a Bit of a Gallop… or….. I must admit that I am a little bit of an adventure junkie when it comes to riding. Although I try very hard to live up to the refined and controlled Dressage world I drift in, I am not averse to a bit of tomfoolery when it comes to my riding. My horses appreciate this about me, and they know that when it is time to work, we work hard. When it is time to play, we play even harder! I have always thought the Equestrian world was split into two very distinct groups – those who gallop, and those who do not. Being in either group is of course not a sin, and those who do not enjoy seeing the world from the back of a horse travelling at ‘3 tear speed’ are by no means less horsemen or women than those of us who do, but there is something to be said about allowing your horse to go as far as he wishes, as fast as he likes that just makes me gooey all over. 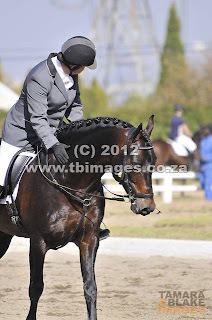 In fact, many horses spend their whole lives being told ‘whoa’ and not ever ‘whoohooo’ and that can be sad to me. 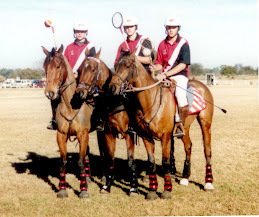 The idea of a Hunt has always appealed to me, and one of my previous horses was a champ on the field. He could jump anything you put in front of him and was beautifully disciplined and quite in control at all times. A real pleasure out. When the suggestion of another Hunt was made by my dear friend and fellow hoodlum, Rachael, I had conflicting feelings about taking my inexperienced little stallion out for a day’s hunt, but the excitement soon became too much to bear and I was in! He had not had too much experience jumping and I had no idea how he was going to behave in the middle of a galloping field, but somehow I knew he was going to enjoy it as much as I did. His owner was not too excited about the idea – “you are going to teach that horse to go wild” – but my excitement and anticipation were evident and there was no way I was going to take no for an answer. 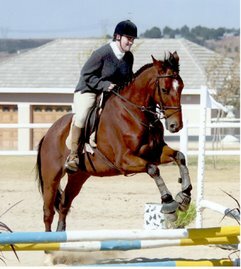 The first thing I realised of course was that my horse was not nearly fit enough and also that I had a small problem, being in a notice month at work and having to put in long hours in at the office was going to mean very little preparation. I kept having dreams where my horse dropped down dead in the middle of a gallop, and that made me even more nervous about the whole situation. I went as often as I could, and took him out for long slow canters in the evenings and hoped that was going to be enough. Finally the day dawned, and the two of us slowly made our way to the Inanda Country Base, where we would meet up with the rest of the hunt. I was quite proud of the fact that I had managed all on my own – not a single set of hands to help me! What a star this little guy is – he loads himself into the trailer, stands patiently and once there, we always tack up in the trailer and when he gets out he is ready for action. 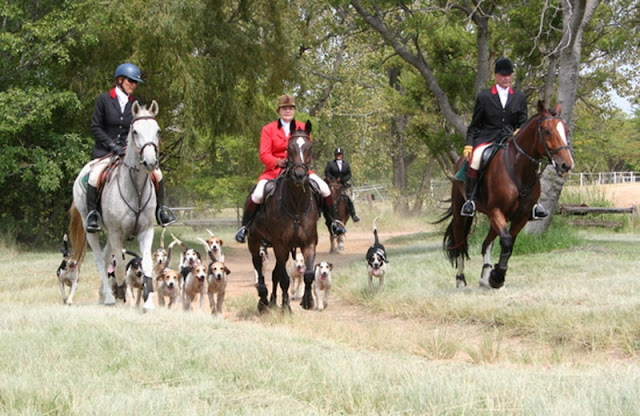 Once ready, we met up with the rest of the very large group in front of the stables where the hounds were gathered. A welcoming sherry was greatly appreciated and then the master gathered everyone together to explain the rules, and suddenly, we were off. 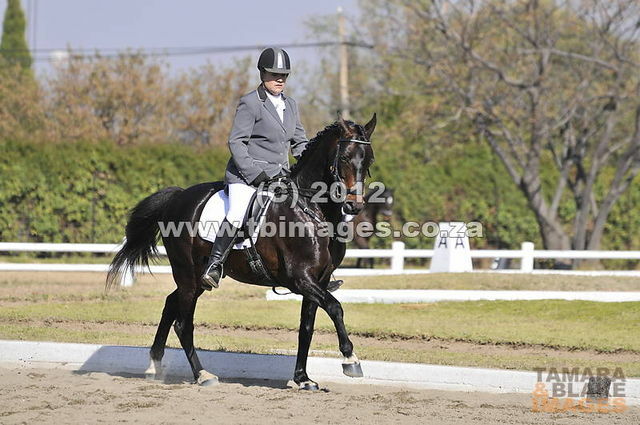 The Stirrup Cup - the Dark Handsome on the Left is Us! If you can survive the first leg of the hunt, you will be quite alright for the rest of it. That first leg is taken at a cracking pace and in our case was the longest - or at least it felt like the longest. The hounds are fresh, the horses are excited and the best way to handle this leg is just to hold tight and let them go. The hunt is run in different legs, stopping for a break at the end of each one until the group gathers and the new scent is laid. The dogs also get a break so that they can catch their breath. I have to be honest and admit that in all my life I have never seen such a big group of well-behaved horses. There was no mad rushing, no mucking about and the horses knew to wait patiently until the horn was blown and the hounds moved off again. The ride was split into groups – those following the hounds and maintaining a cracking pace and those who wanted to go a little bit slower. At every break, you can choose which group you wish to go with, which is a nice way of giving your horse a breather and pacing yourself. Nobody really even noticed that my horse was a stallion, and I found the crowd of riders to be wonderful. Everyone chatted and socialised on the hunt and people were so genuine. It was a great way of getting together with a crowd of people who all loved their horses and were proud to be there and wanted to have a fun day out. Diving Into the Dam - Look Out! Near the end of the day there is a dam that gets crossed. 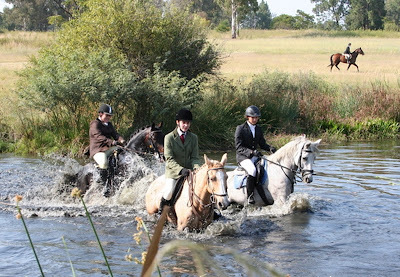 I was a little nervous about this – firstly since I had no idea how my horse would take to the water, and secondly, with him being so small, the water would be much deeper for us than some of the others. I had just started to relax and enjoy myself, when suddenly, we came around a corner and there it was. No time to stop and look and no time to hesitate. Of course my horse was a trooper and decided the best way to tackle the water was to take a giant leap in! I just held on to my breastplate for dear life as he disappeared under the water and took a giant leap up once his feet hit the floor. It was most exciting and so much fun – even if we did end up a wet, muddy mess! I kept the jumping to a minimum, as he has no experience in jumping at speed out in the country, however next time we will do a little more since he will be more used to the pace. That is the nice thing about a hunt – you decide how much or how little you do. 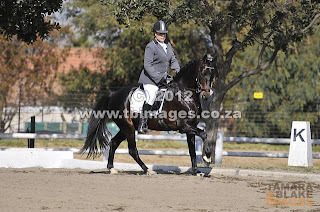 If you know your horse well and listen to him, he will tell you to slow down or that he is handling the pace. Coming in to the home stretch was quite a mix of sadness and I must say, relief! Four or five hours of strong riding out was exhausting for both of us – in fact I was so stiff after the hunt, it took about four days before I could walk straight again! Fortunately, he had a visit from the chiropractor a few days after the hunt and checked out 100% so he recovered better than I did! That was a first for me, who has never really been stiff no matter how much riding I do! Once all the horses were untacked and watered, everyone gathered in the clubhouse for a friendly drink and chat before heading home again. What a super day out and what a smart boy I have – he was well behaved, he didn’t drop dead from the work and all in all we had so much fun I certainly will not hesitate to join the next one. There is something quite archaic about galloping along with the hounds running in front and beside you – it makes you feel like you are in a time long ago when life was very different but the love of horses no less strong. Photos courtesy of the Rand Hunt Club website - thank you for a wonderful day out! I have a little confession to make… I had a riding lesson. And I really enjoyed it! Now don’t get me wrong. 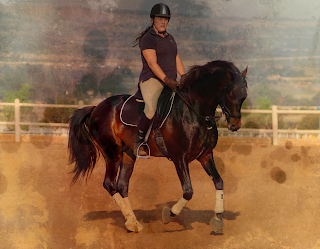 In my pursuit of riding excellence I have had many an hour of work without stirrups, lunge lessons, I still have monthly lessons with my wonderful Dressage trainer, but I am talking about a good old-fashioned riding school group lesson. Hopping onto a long suffering and slightly work worn beast and having a good old romp around with a group of other folks. The kind of lesson I still teach regularly. While seemingly unimportant and not very grand in the major scale of things it really got me thinking. One of my very dear friends is giving up teaching after 16 years and we sat discussing the reasons and the thinking behind her decision. “I just don’t enjoy it anymore. I cannot think up another exercise for anyone to do and I just cannot bear another hour in the sun shouting ‘heels down, chin up’ and watching people go round and round endlessly without getting anywhere!” she told me with a grimace. The sausage factory syndrome – endless hours of churning out ride after ride and pretending to be very interested in everyone when in fact all you can think about is how really nice a martini would be under a tree at that point! You only need to survey any group of riding school ponies on any given Saturday morning. Half of them look like they are asleep and the other half look like they wish they were dead! If you look a little closer sometimes, though, you will notice something else. Happy, giggling 5 year olds with bags of carrots and curry combs in hand. Teenagers who would otherwise be in a Mall doing who knows what, happily hanging out with each other, drinking fruit juice and talking about the latest trends in Showjumping training. Adults who dreamt of owning their own ponies as youngsters but never had the chance and can finally live out their dreams of riding and being around horses and savour every moment. Whilst riding around on my weather beaten but very sweet riding school horse, being put over fences and told to look up and ride circles and all the other things that I would easily be standing in the middle of the arena shouting away, it suddenly dawned on me how wonderful it was to be on the pupil end of the deal. I had honestly never realised how much fun it was. I suddenly realised why so many people keep coming back week after week for their horsey fix! Sometimes as instructors we lose sight of the enjoyment we are gifting other people. Sure, it is a hard job and we very often never get thanked for standing out in all weathers trying to help riders become better and have fun. There are people that we love seeing week after week, and let’s face it, there are some people that we cringe over when we see them coming, but at the end of the day never forget that we are giving people something they can never get anywhere else and they love it so much that they keep coming back for more! 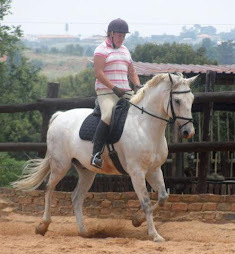 We also often get stuck on the competitive riders with their own horse that we forget that there is an entire community of passionate horse-lovers that will never compete or be able to own their own horses but they are just as passionate about their weekly riding lessons! Coming up with new ideas can be tough, especially after years of teaching. I often see how my fellow instructors, and even myself, get caught up in the factory of pushing out lesson after lesson. Sometimes all it takes is a little bit of reading, a bit of Googling and you can come up with fresh new ideas that will be exactly what everyone needs to discover how much fun riding can be. Sometimes we get caught up in the world of competition and performance and we forget that there is fun to be had. I would like to urge all my fellow instructors out there – never underestimate how much people enjoy coming to your lessons and even though from where we stand things can be tough, never forget that the joy of sitting on a horse is something that should never be taken for granted by anyone! Human personalities are a well-researched and well-known fact. We are all born with our own distinct personality and as we grow our environment causes us to react and respond to life in a way that reflects back to that personality. 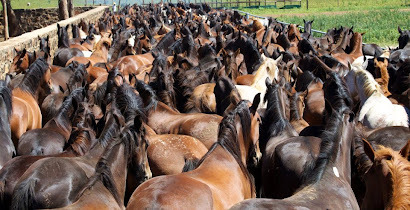 Horses are very much the same and there are distinct personality types that can be observed with horses and how they react to their environment. 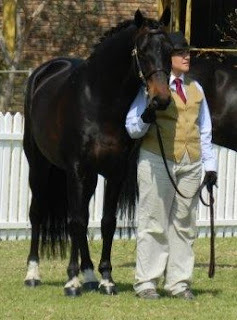 The way in which a horse interacts with us and responds to his training can be a direct result of his personality and when working with any horse it can be valuable to first determine what that personality may be as a predicting factor in how he must be handled and worked and what can be expected along the way. It is also worth knowing your own personality type since that will also have a huge impact on the way you relate to your horse and his training. 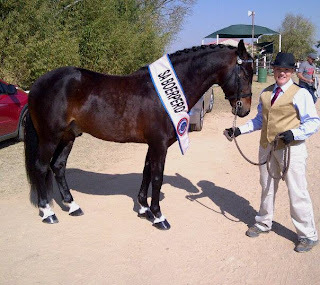 I have had exposure to many types of personality when it comes to horses and the most common ones would certainly be the more extrovert type, the pleasers and the stubborn personalities. 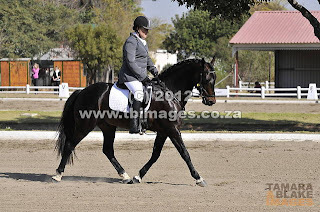 They fit my own personality well as does mine the discipline of Dressage which I love. 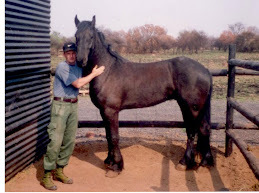 Before this little stallion came into my life I had not had too much exposure to the fearful horse and had never had to reckon with raw fear as an obstacle to physical and mental training. 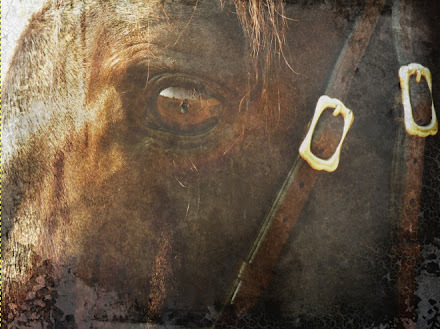 Before we look at the fearful horse in detail, let us take a broad look at some of the theories of both human and horse personality. There are a number of different opinions about the way in which horse and human personalities can be described. J. Warren Evans writes in his textbook, Horses: A Guide to Selection, Care and Employment, that there are six basic temperament types. He defines them as quiet, interested, nervous, extremely nervous, stubborn and treacherous. Yvonne Barteau, writing in the popular Dressage magazine, Dressage Today, lists the kinds of personality as four basic, clearly discernable personality groupings, which she lists as social, fearful, aloof and challenging. 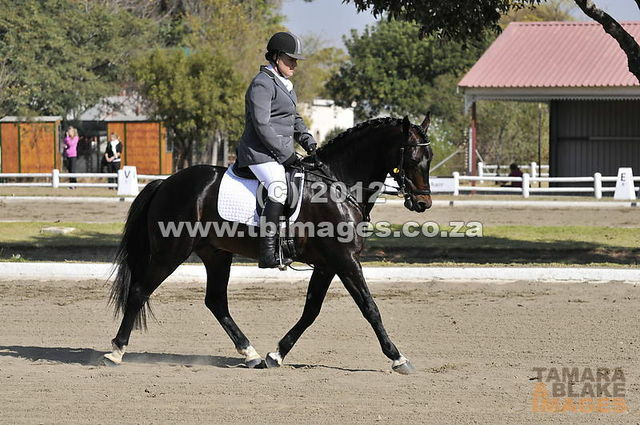 Britta Schoffmann, in her book, Dressage Training Customized, discusses 6 natural personality types when relating to training, as well as three “rider made” types of horse where training and the act of nurture over nature has had an influence on the horse’s reactions to his environment and training in terms of his personality. The young horse is mentioned as a special case on its own. I particularly enjoy Britta’s views and descriptions of the personality types and would recommend this book to anyone who is interested in making sure that they are taking the horse’s personality and conformation into account when tailoring a training program. 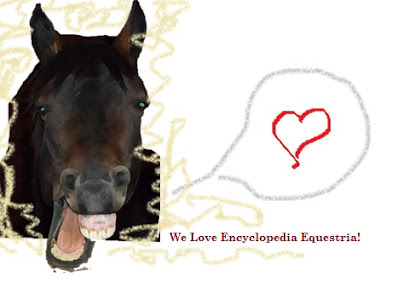 Let us take a look at the information we have at hand about the fearful horse. 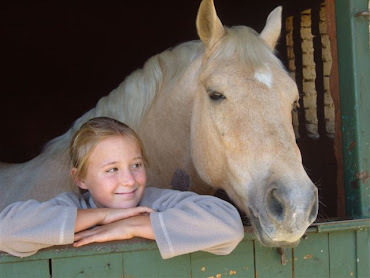 Britta categorises the fearful horse into two types – those that are born fearful, and those that are made fearful by poor interaction with humans. Horses are prey animals, so fear is part of their inherent nature, although years of selective breeding have lessened the need for flight. When a horse that has a natural tendency is bullied or that fear is reinforced by human handlers, it can spiral completely out of control. 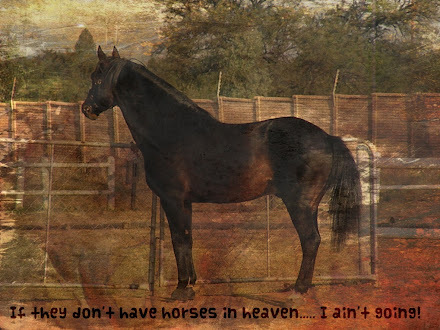 The most noticeable thing about these horses is that they lack self-confidence. 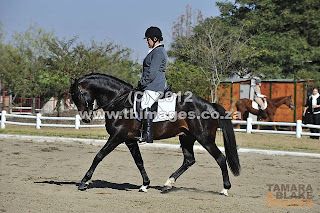 When training and interacting with this type of horse, it is the first thing you should notice. They will never suppose that they can do anything and if they can be coaxed to try anything, their initial response is “oh dear, was that wrong, oh no, please don’t punish me!” before they have even given you a chance to say, well done! When they do make a mistake they will often retreat mentally and will not try again or be persuaded that it is ok to make a mistake. The sad fact with these horses is that many of them are really very talented individuals who could go far under the right circumstances but are often hastily passed along in a competitive situation simply because in the competition world, time equals money and there is no time to be spent coaxing a fearful horse out of his behaviour and instilling confidence. Patience is the number one key when working with these horses because training is a slow and painstaking process, but the end result will always be well worth the struggle. These horses will often have ‘triggers’ that will cause the horse to retreat into the panic, fearful state and part of the training is to introduce the horse sympathetically and careful to the triggers and try to lessen the fear response. The fear response will show in two different ways, I have found. The horse will either have an immediate outward response that will be sudden, violent and he will go into flight mode at once; or; he will go into an inward flight mode – when riding you will notice that suddenly the horse is not ’with you’ anymore and after a while suddenly “explodes” as he comes back to you. When they go into that internal fleeing mode, work is almost impossible because they will not respond to you at all and will not absorb anything you are trying to teach them. They will tend to freeze up until they cannot bear it anymore and will then only explode suddenly to escape the situation they see as threatening. They can be hard to handle from the ground and even worse to ride. My own experience with the fearful horse began in May this year when I was introduced to LCT; a beautiful little stallion hiding away in the corner of his stable. He would not let you touch him if he could help it at all and if you had to touch him he would quite literally freeze up and cringe and as soon as he could would move away and go hide in the corner again. For two months he did not put his head over the stable door and he would not take food of any kind from a human hand. Or even a bucket in a human hand for that matter. 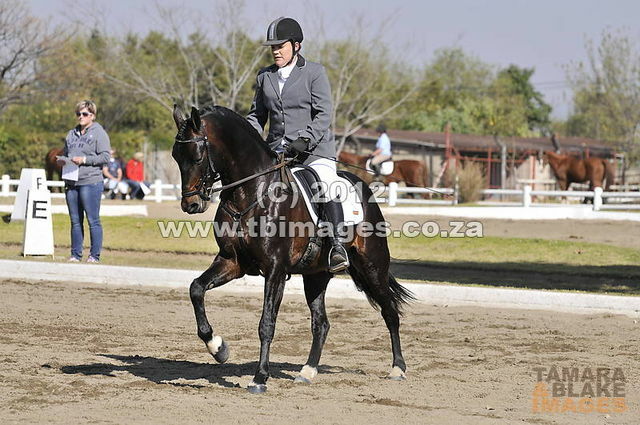 What I did not know about him then was that he is one of the foremost breeding stallions of his breed in our country and that his children are talented Dressage and Showjumping stars. In his younger days he was one of the top in-hand show stallions in his class and in ridden classes on a good day was unbeatable. The breeding farm, in fact, via his progeny have won Stud of the Year for 2012 just a few weeks ago. This boy is talented. But ruined. 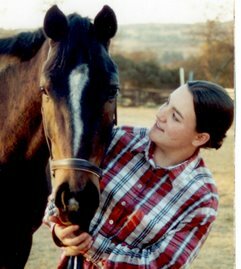 He had been turned out to pasture and had not been ridden for at least 5 years prior to us working with him because he was deemed dangerous and people were of the firm opinion that a woman would never be able to handle or ride him. The first stumbling block I faced when trying to ride him was that he would not actually let you get on him! As soon as he realised you were going to get on him, from a mounting block, leg up, or any other creative method I devised to get onto him, he would shoot forward and if you did get a foot in the stirrup, he would bunny hop off with you until you came off and then you would repeat… Once on, he would go into a tense, almost saddler like way of moving – up in front, legs pounding away and running for dear life. He had no idea of contact, no brakes and even a pat on the neck would give him such a startle that he would jump up and start to shake. He would also sweat. Boy, could he sweat. The sweat would run off him, making puddles around his feet if you stood still on concrete for long enough. Even now, I know when he is stressed about anything because he will immediately break into a terrible sweat. 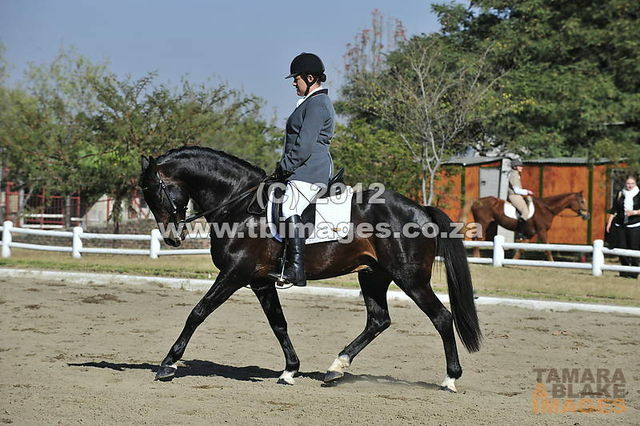 A crop of any kind is not an option with this horse – not when riding him or from the ground, which is complicated by the fact that because he is not working in self carriage yet, he needs to be reminded that his hind end must be quicker and to keep moving forward. The entire process of being ridden he found traumatic and at times completely unbearable. From the ground he was never unkind or mean, just nervous and blocked off to any interaction with humans. That was an important clue for me – the absence of any mean or violent behaviour. 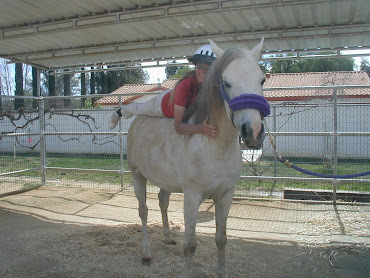 A horse that is this fearful but does not become violent towards his human handler is a horse that can be rehabilitated. When the horse is expressing fear in a violent or dangerous way, chances of rehabilitation become much less and those kinds of horses have to be handled by professionals only. To start with, I had to get him used to me without causing too much distress so it quite literally began with me sitting in his stable reading magazines and not doing anything. The first thing you want to do with these horses is spark some kind of curiosity. Because they are so blocked off, they will not notice you or want to interact with you, but if you persist, they will come to you and show even just a tiny spark of interest and that is where your journey will begin. I believe greatly in join-up, or, lock-on as it is sometimes called, so it is something I will do right at the start of the training process. His reaction to this was very interesting because initially, he was in flight mode – wanting to escape me and not anything else. It took quite a few tries of go and come but eventually he gave the clues – mouth softening, frame softening and eventually lock on. With these guys often the clues are very subtle – if they follow you around they will do so from a slight distance and if you turn towards them again they will take off into flight mode again easily, so it is important to recognise when they are joining up as it is not often as pronounced as with other horses although it is there. If you wait for complete ‘puppy dog mode’ you may miss it and end up going on for hours! Touch is a very important part of the healing process with any horse that is fearful and has a past. When a horse has been made fearful through touch – ie being hit, roughly handled and so forth – you will need to use touch to gain trust. This little guy would cringe when you laid a hand on him, so starting with just putting my hand on his shoulder and keeping it there for a while until I saw signs of relaxation, gentle grooming and always always touch. When riding him I will still put a hand on his shoulder or wither in front of me when I feel him tense up and just keep it there until I feel him come back to me. It has become my way of trying to prevent him from ‘disappearing’ under me when he gets worried. Never a pat, just a touch or scratch. I am by no means a new-agey, touchy feely rider or person, however I really did find this to be of great help to him in the beginning. Just the act of quiet touch at all times. Using food as a reward and tool, which I have always used with great success proved to be a problem at first, since he would absolutely not take anything from a human hand. It presented a challenge in the beginning because there was no reward that I could employ that would help him understand he was doing a good job – a pat or rub was stressful, an enthusiastic ‘good boy’ was not something understood or liked, food was not tolerated. At first I tried to use backing off as a reward – retreat a little and back down. 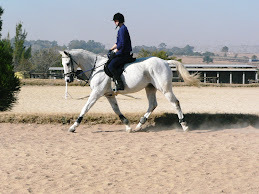 That was not always practical though – when lunging or riding he was too stressed to notice. I will never forget the day he took a treat from me for the first time – I will eternally be grateful to Kieffer for making their divine Apple treats, because that was the first thing he showed any interest in. Today, he will sell his soul and probably do back flips for a Kieffer cookie! He can smell then a mile away! It was a case of try and try and try. Finally, he noticed it, had a taste and for the first time his focus was on me. It was breakthrough. He now is making up for 10 years of lost treats and will eat carrots with great gusto! Anything new is still treated with suspicion, but the Kieffer treat and carrot is always a winner. Another unusual trait with this little guy that was surprising to me was his unusual sensitivity to anything. If, for example, you change a piece of tack, let’s say using bandages one day and boots the next, he would be completely out of his comfort zone. The first thing that you notice is the sweating – then it will take a good 20 min to find his focus again. Changing arenas would do the same thing. At first I tried to keep everything simple and make no changes but as his trust grew, I made a point of changing just one thing every time – a different set of boots, a different arena, riding with music, having people stand next to the arena (his absolute fear) and so forth. We go on plenty of outrides and I let him have some choice about what he does at times – it took him a while to discover the joys of a good gallop, but now he that he has, boy oh boy! The Dressage training is a slow process – we have had to start from scratch and drill the basics – relaxation, straightness and contact which are so vital, are things he really struggles with. He has a very difficult mouth – the scars around it tell a story as well. 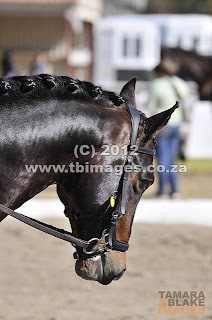 We have tried a few bits but he was very resistant to them all – I eventually after thought decided that what he fearful of was pressure on his tongue and so tried a Myler Comfort snaffle on him that has a greatly reduced amount of tongue pressure. This was another breakthrough in his education and he was although not perfect, much happier in that combination (we use a comfort bridle as well) and work is progressing slowly but steadily. I introduced some jumping as well, because it was something he had never done before, as well being something that would ask him to make decisions and choices – something he has never been allowed to do. He absolutely loves it – it gives him the freedom to make his own choices (all of which have been good ones! ) and to have fun, let his hair down so to speak. We only jump very small things as I want him to keep gainaing more and more confidence and if he finds an exercise too easy, I can make it more complicated without actually having to raise fences beyond 60 or 70 cm. When outside, we jump logs and ditches and go through puddles – all targeted at trying to expand his educatina dn give him confidence. 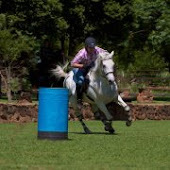 One important thing that you should know about working with the fearful horse is that when they start to gain more confidence, they will begin to test boundries. 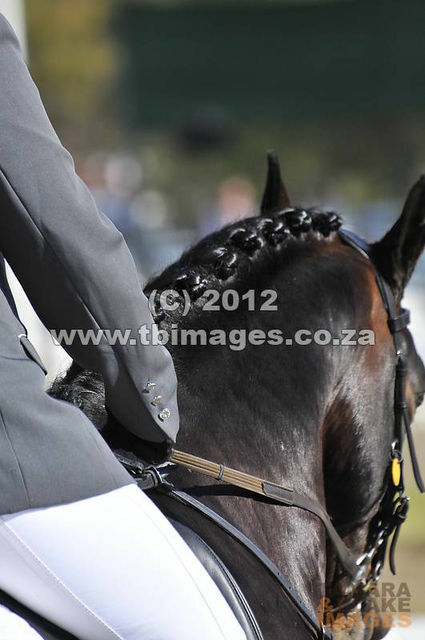 That is also partly because the rider will tend to coddle the horse a little too. Always be firm and reasonable. Boundries are what give confidence. By feeling sorry for them and letting them test and get away with things you begin a see-saw kind of test, punish, retreat, cycle which is not productive at all. 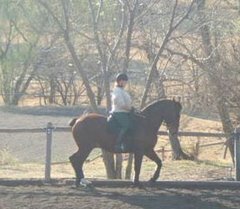 My rules apply – stand still for me to get on (that was a lot of work but now he knows! ), when we work, we work, no looking for girlfriends while we work, when outside, we go as fast as I say, when I say and where I say. There is no need for beating or shouting – with him a firm no will do the trick or just positive riding and keeping his mind focussed. Because he is so scared of any crop or stick and even a baseball cap scares him, I devised a clever way of reinforcing without sending him into a fear spiral. I have taken the bottom strap of a flash noseband and have worked it through the D-Ring on my saddle. In that way it is not in my hand, he doesn’t notice it and it holds no stressor for him, but if he is in a place where he needs a bit of backup to the leg or he wants to go out the gate or anything, I just take the strap and tap him once with it, let it go and he gets the message without the need for a crop. It has worked really well as an alternative reinforcer. 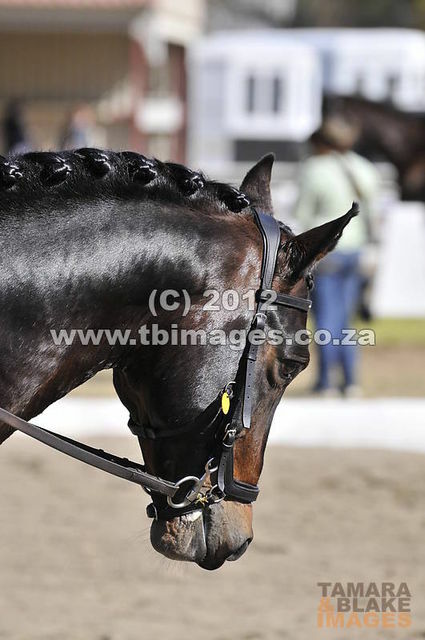 With this I don’t mean to say that everyone needs straps – what I do want to illustrate is that when working with any horse, you have to think outside the box and really try to understand what is going on in their heads and how you can help them. Sometimes unconventional methods can be of great value! We still have a very long way to go and it will be years before he is truly happy in his work but the journey thus far has been fantastic and every little scrap of progress, no matter how small, is a gem that I value highly. The hot fearful horse is a huge challenge, but if you can work miracles, it will be worth every bit of hard work you put in. I would like to take this opportunity to wish you all a blessed and wonderful Festive Season! My wish for 2013 is more horsey learning, more competing and lots of success to you all! This has been a busy busy year with loads of teaching, competing and training and I can't wait for the new year to get busy again and enjoy my precious boy and my students and keep learning and keep growing and having fun most of all! 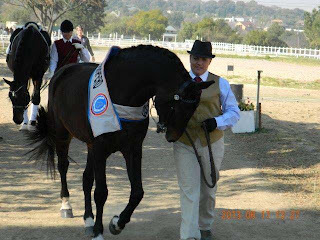 "Johannesburg – Paul Hart's withdrawal from the equestrian event at the Olympic Games in London has cost him almost R1 million, The Times reported on Thursday. “I've had to pay for my horse to live there, to be fed, to be looked after; (that) and horse shows, cost me huge amounts of money,” said Hart. Hart said his horse Heartbreak Hill's flight to the UK had cost R120,000. Based in Johannesburg, he ran a business keeping horses and training riders. When he left two months before the Games he lost his business, with many clients and sponsors leaving him. “I am humiliated. I am very humiliated. You leave South Africa as a hero and you come back as a nobody, really. It is not how you want it to be,” said the 44-year-old. “You have to be based in Europe. In the last local competition I did, there were seven people ahead of me who were medallists from European, world and Olympic competitions. And there were others behind me.” – By Sapa "
Paul we were rooting for you and you were our champion! This has dealt a severe blow to the equestrian community and we are saddened that once again incompetence and politics took an upper hand. South Africans have to compete with the World in isolation and financial ruin and you finally showed us that with enough hard work and determination any rider could go all the way to the top. On behalf of myself and on this forum I would like to say that we are still in your corner, you have our support! A Journey Out of Fear - Coming Soon! There is always one horse that comes across your path - the biggest challenge... the most to gain and the fate of that horse resting on a knife-edge. I have met that horse! He came to us a scared little stallion, cowering in the corner of the stable and unable to even accept food from a human hand. Fearful of being ridden, fearful of being handled and most fearful of any crop, I was honoured to be given the challenge of unlocking a potential that I KNOW is hiding beneath all the fear. So far this juorney has been everything I expected, AND MORE! The last three months have been the best, the worst, the most thrilling and the most frustrating of my horse career to date but the progress that is being made is thrilling and amazing and in the next few months I will be sharing this journey with you. I am not sure where we are going to end but I do know that this little guy is going to be something special. I can't wait to share everything I have learned thus far with you all. 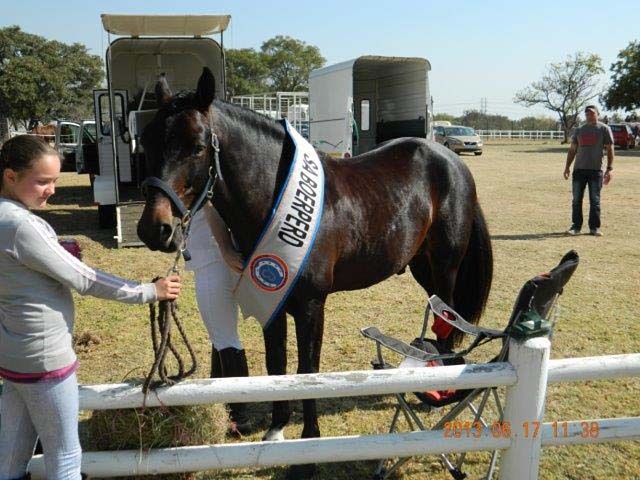 Quick congrats to Gerdi who has kicked off the season with a bang - 1st place at the First and 2nd School's qualifier, 1st place at Gauteng North's Championships plus Champion Pony rider and now a good 6th place at the Easter Festival in a group of strong competitors from across the country. I am very proud of you! 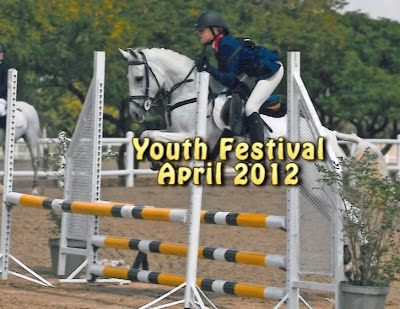 Gerdi has also gone on to win the Youth Festival 80cm Pony Rider Championships! You guys are just awesome to watch! "Talent without discipline is like an octopus on roller skates. "The fastest way to get where you're going is to take your time." Please note that although this material is available in the public domain; articles, illustrations, video material and other subject matter that I have written or drawn are subject to copyright. Should you wish to make use of anything posted on this site I am most happy to do so subject to you asking to do so first. The quality of the seat determines whether we can even speak of “riding”, or whether the horse simply has to “deal with” the load on his back.